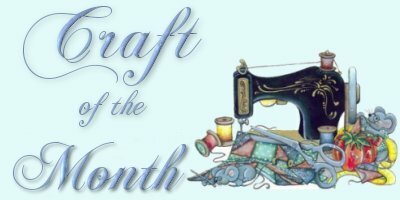 My Parents Are Survivors "Archived Craft Classes April 2000"
Small card with poem printed on it. (Optional) If you do print the small poem you may want to laminate it. Clear shelf paper makes great laminating paper. Everything listed can be found at Wal-Mart. Take handkerchief and fold top part over (5 in.). Take ribbon and cut three pieces 9 in. long and set aside. Take a small amount of fiber fill and place in the center of inside folded area. Gather the handkerchief closed around the fiber fill, this will make the angel's head. Now take one piece of ribbon to tie around the gathered area to hold the handkerchief shut where you gathered it. Take the two remaining pieces and tie one on each corner of the handkerchief and make bows, this will be the angel's hands. Next take your eyelet lace. The length of the lace will depend on how big you have made your angel head. The lace for this angel was 7 in. long. Attach it from one side of the head to the other with hot glue. This will make it look like the angel has a bonnet on. 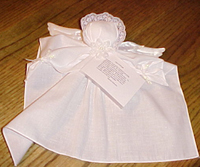 Attach angel wings to back of handkerchief and head. Then hot glue flower and card to the font of your angel where you tied your ribbon to make the angel's head. strength is sent to you and me. Note: All materials for this craft can be found at Wal-Mart in the craft department. First paint wooden box inside and out with Gold paint. When it dries hot glue ribbon and flower on to the top of the box. Refer to picture when placing ribbon and flower. Print following card to place inside the box. already been taken care of...didn't you know? Note: The paints I used are oil paints. Also allow drying time for your pocket. After gathering your materials and cutting out your blue jean pocket from a pair of old blue jeans you are ready to begin. First put on the gloves and dip your pocket into the polyurethane squeezing of the excess. Then place pocket over and empty container such as spray can to allow it to dry. After your pocket is dry drill a small hole in the upper right and left of pocket to attach wire for hanging. Now it's time to decorate the pocket. You can do this in different ways, by painting sunflowers on as I have done, or use a sponge flower and sponge some onto the pocket. You may leave the pocket bare if you would rather not have a flower on it. Flower: For realistic looking flowers always use two or more shades of color. Example for petal use mixes of yellow. Mix #1Yellow no white Mix #2 Yellow with equal amount of white. Mix #3 White with a very small touch of yellow. Paint petal, using Mix number 1, add mix #2 to the top of it and then use Mix #3 for the very top edges for the highlight on the flower. In middle of the flower is brown, with a small amount of yellow dabbed to the top of the circle and white on top of the yellow. Refer to photo. 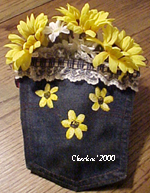 After you have added the flowers to the front of the pocket allow it time to dry so you will not smear your flowers. It's time now to hot glue your lace onto the pocket. After you have done this fill your pocket with moss (you don't need it if you rather not use the moss). Arrange your sunflowers in pocket. Pocket is ready to hang. Note: Paint color can be changed to color of your choice. Also flowers. Other ideas: Crochet a small bunny and glue to each end, or do a bunny in plastic canvas. After you have emptied your canned ham, wash can and allow to dry. Drill two small holes on each end of can. Side by side spaced about an inch apart. This is the fun part. Take your paints and place medium amounts on a plastic butter lid, styrofoam meat tray. Something to place paints on and use sponge to dip into paint. Cut a small part of your sponge off to paint with. Dip your sponge in all three paints and sponge can. Cover the entire can inside out and bottom. Allow this to dry. Handle: Cut your handle from the clear plastic canvas. It should be 3X80 ( 3 holes wide, 80 holes long). When can is dry use needle and yarn and sew the handle to the can. Do this by using the two holes you drilled. Sew making an X going in and out the plastic canvas and holes in can. Do this several times as you want your handle to be attached firmly. Cut off excess. Glue a flower to each end over the X you sewed. Place grass and eggs in basket. This is pretty simple and quick to make. Have fun.